Desiree: Then he wanted to observe her play behavior to evaluate her levels of drive and motivation. She would not play. I tried to tell him that her prey drive is fine, very high, but he didn't really believe me. I explained that she was just more interested in bunnies, cats, squirrels, and other large or small mammals than toys, but to no avail. I could see she had already failed in his mind, and he was honestly surprised I would even attempt it with such a lousy dog in the first place. I thought he wasn't even going to let me take the actual search test. I was ready to strangle Sophie and just give up. I had resigned myself to a having to find a new dog. Finally, he started the search test, although he clearly wasn't holding out much hope. I got out Sophie's harness and long line, and she gives me this look like "Finally! Something worth my time and attention!" Then Sophie changes into a completely different dog...attentive, focused, motivated, driven and obedient. Her performance on that portion was excellent. She successfully completed search scenarios much more difficult than anything I'd trained for up to this point. The evaluator said he'd never seen anything like it; he said her temperament had done a 180 degree turn. He said he couldn't believe it was even the same dog. He passed her with flying colors, said the obedience could be worked on and that it wasn't really that important what she did when she wasn't working anyway. The evaluator said he had never even heard of a dog behaving like Sophie in his many years of training. But, interestingly enough, she is the first Ridgeback he's worked with. He asked me if she was typical of her breed and I told him that from everything I had heard, she was, at least for the breed at her age. He said I must be a very patient person and he didn't know how he'd deal with a dog like her, but that her SAR abilities would make her worth it if somebody had the patience. Allex Michael: Some experts believe that breeds with a high obedience aptitude should be the only dogs available as pets. With the amount of time and effort most owners devote to training their dog, they certainly have a point. 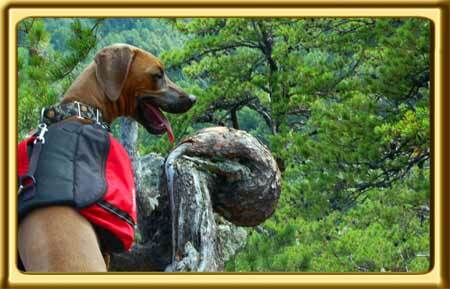 Desiree and my experience, along with other ridgeback owners to whom I've spoken, helps you read between the lines of the Rhodesian breed description. Unless you have successfully trained one, the Rhodesian ridgeback is likely not the breed for you. Hopefully, Desiree will keep us updated on Sophie's progress.